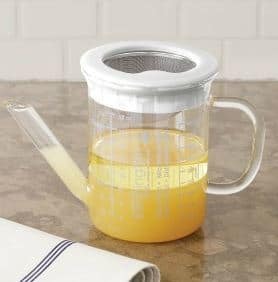 (8) Strain pan drippings into this heat-resistant glass, laboratory-quality Fat Separator and Strainer ($24-95-$29.95, updated from original picture). Fat rises to the top and the low spout pours off the flavorful juices. This clever product is dishwasher, microwave, and oven-safe.